Use #Mayfairwrap and tag me @ktandthesquid when sharing on social media! I joined the CGOA last year when I found out the annual conference was being held near by. I’ve always wanted to attend but the logistics of travel was always an issue. Attending my first conference was a huge eye opener for me. I met so many amazing people I knew virtually in person. Approx. 68” long by 16” wide. 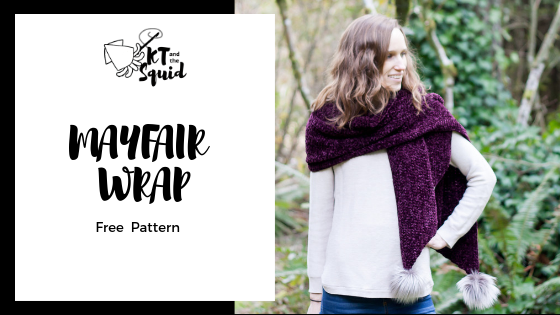 The Mayfair Wrap is worked sideways and is easy to adjust the length or width. Sew pom poms onto the points of the wrap. Looking for more free patterns? You can find all my free patterns HERE or checkout All Free Crochet for thousands of free patterns!